Another outfit post for you today! It's lovely and sunny and warm so I decided to dare it and only wear this! Theres something good about not wearing a coat, even if it is still February! The main item I wanted to show you today are the new shorts I got yesterday from Topshop! I had a £40 voucher (thanks to my valentine) so had to buy these when I put them on. I decided they would be prefect all year round as I still haven't worn a pair of jeans this winter, isn't it dreadful? Anyway, I can't wait to wear these for Summer with sme pastel colours. Oh what the sun does to my little brain on days like this! The brogues are also a new buy, well I got them last week from Primark and they fit perfectly. I had always wanted these as theyre very basic and can go with many outfits. They were originally £14 but to my luck, they were reduced to £6 and in a size 6 which is a rare occurance for Primark! The bag is my new love. I got this from my home town's charity shop and fell in love straight away! It came with no handle but managed to find a detachable strap from one of my old bags and put that on right away. It is now my favourite bag as its so different to anything I find in the shops. Also got the skull necklace (which I forgot to get a picture of) from the Topman sale once again. I really recommend going into Topman to see what you can find at the moment as the jewellery in there is much more to my taste! Those shorts are amazingggg, as I said on twitter! LOVE the jumper too! Love your shorts, that bag is such a find! Love those shorts! 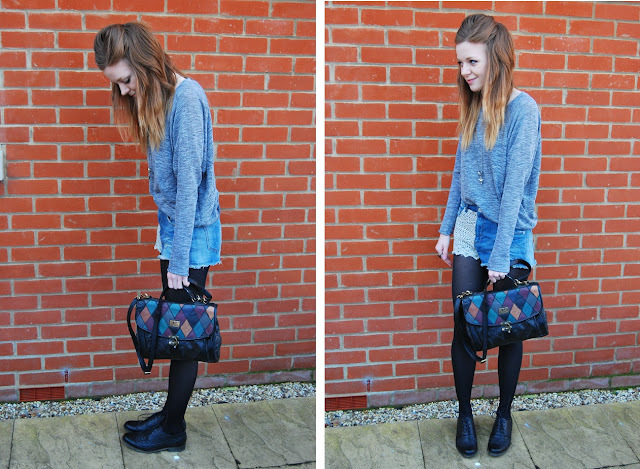 I have that grey jumper, I wear it so much - so so comfy! I love this outfit, you look adorable! The jumper is ace, I want it! Those shorts are way too cute, love them!! Very good valentines present ! In love with the bag too..